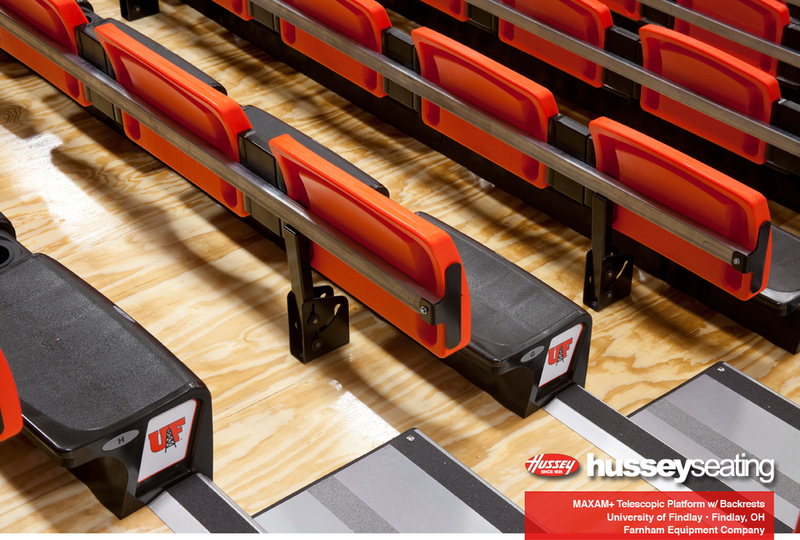 Modernized gym bleachers is key to any University's athletic programs. 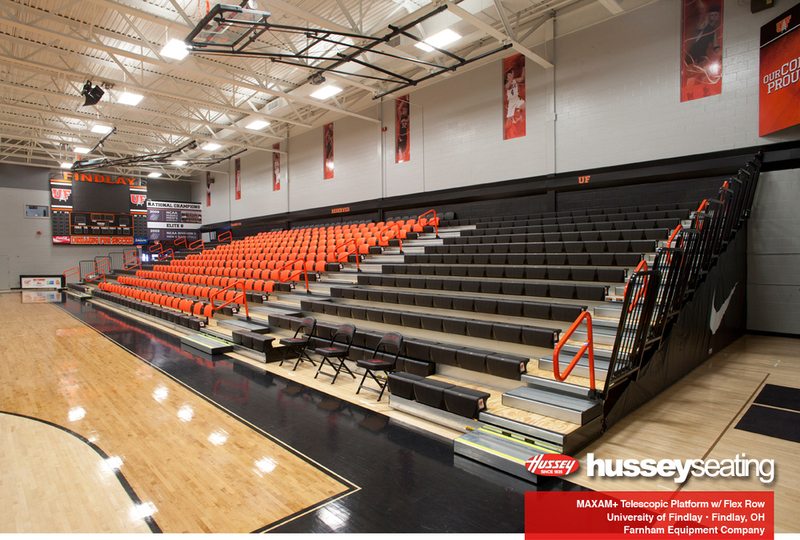 The University of Findlay replaced existing Hussey bleachers even though they were in great shape to update their arena to today's standard. 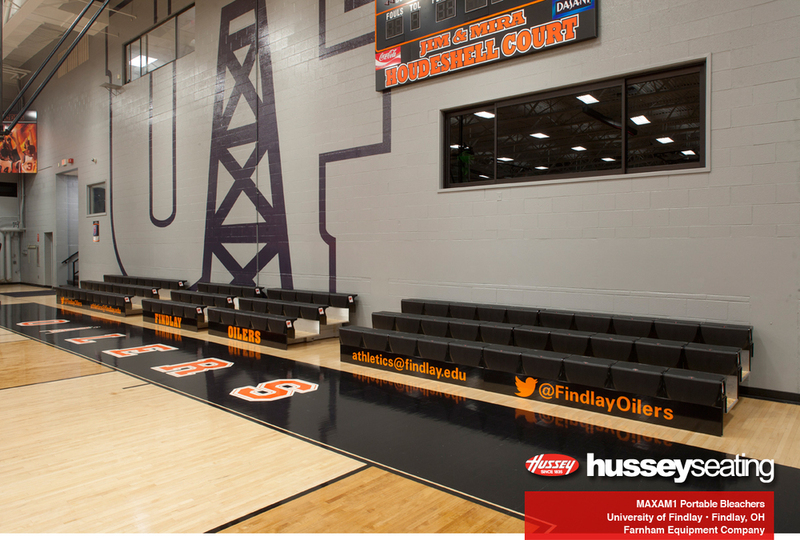 The University of Findlay in Ohio is a Division II school and 2009 DII National Champion recognized for its successful men’s basketball program. A source of great pride for the campus and community, the men’s basketball team always attracts its fair share of local support. 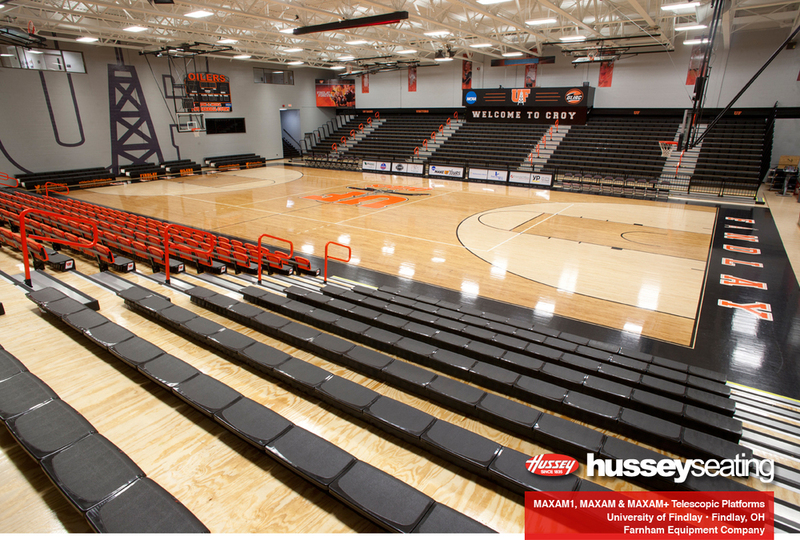 But its Croy Gymnasium, built in 1969, had been equipped with the same Hussey wooden bleachers for more than 25 years. Though durable and able to withstand the test of time, they lacked aisles, handrails, and other amenities characteristic of modern arenas. This made the space less than ideal for the type of public athletic events it now hosted. 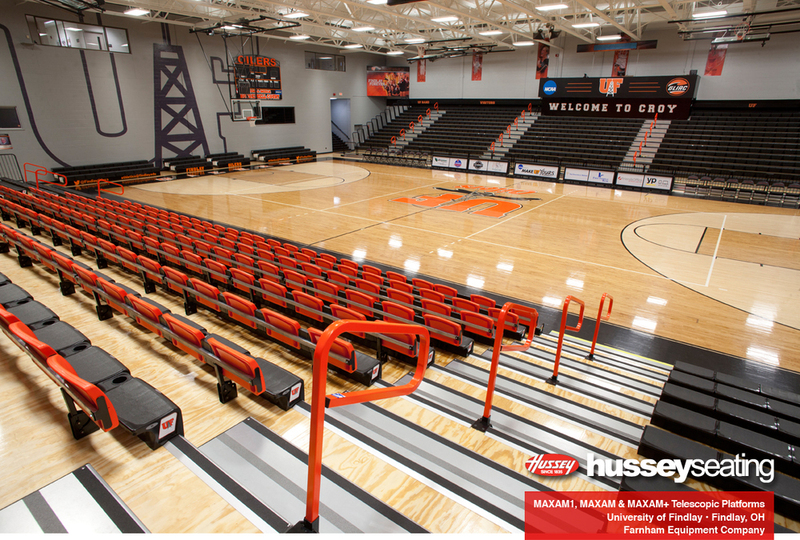 For The University of Findlay, a private university with enrollment at 3,700, aesthetically pleasing high-quality facilities were pivotal to recruiting new students and championship student athletes along with fans and boosters. Not only did the bleachers lack aisles and handrails, but they also extended clear up to the court line. This placed spectators a little too close to the action. The university knew it needed to upgrade equipment, but they wanted to retain the gymnasium’s overall footprint. So concerns arose that any renovation might decrease seating capacity and ticket revenue, which would be detrimental. 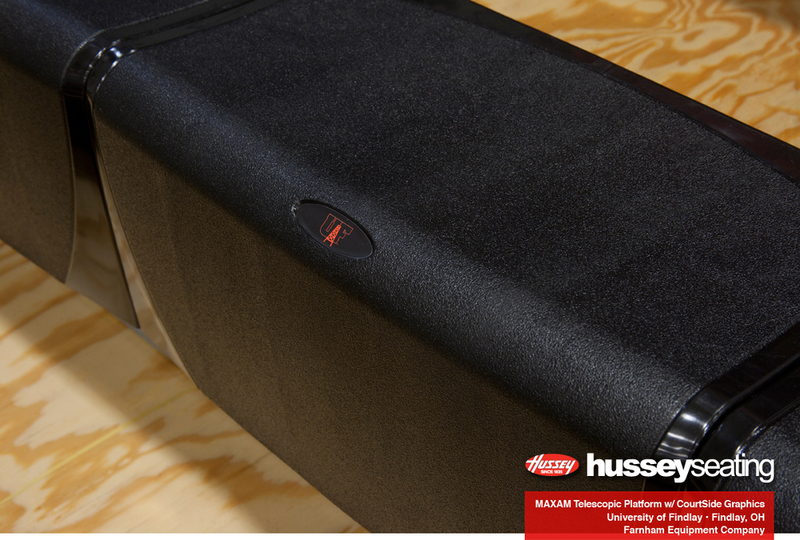 While the university had already identified priorities, the team at Farnham Equipment Company, Hussey’s exclusive Ohio dealer, needed to understand their business, their space, and their renovation challenges before brainstorming potential solutions. “We went into this project knowing, or thinking that we knew, what we wanted. We found out quickly that because of Farnham, because of what Hussey is able to offer, we had several options – several very good options,” explained James Givens, Associate AD at The University of Findlay. 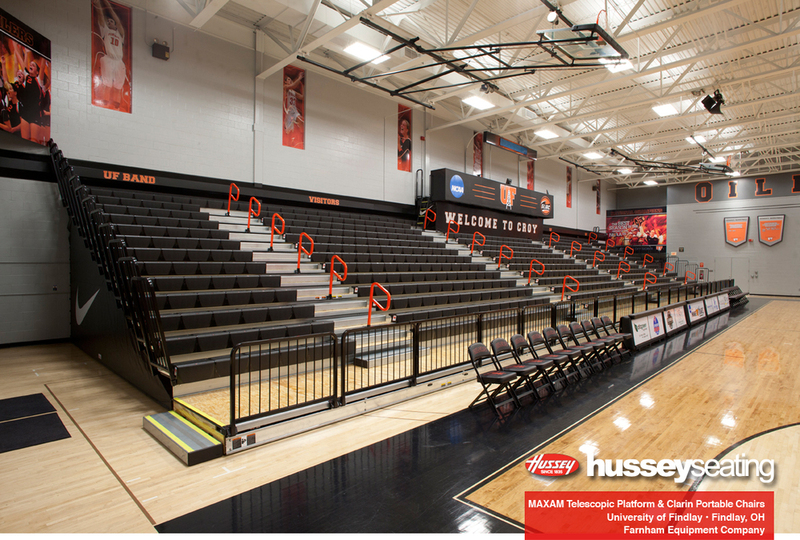 Outdated equipment was first upgraded with the latest code-compliant MAXAM gym bleachers to improve fan safety and the overall spectator experience. 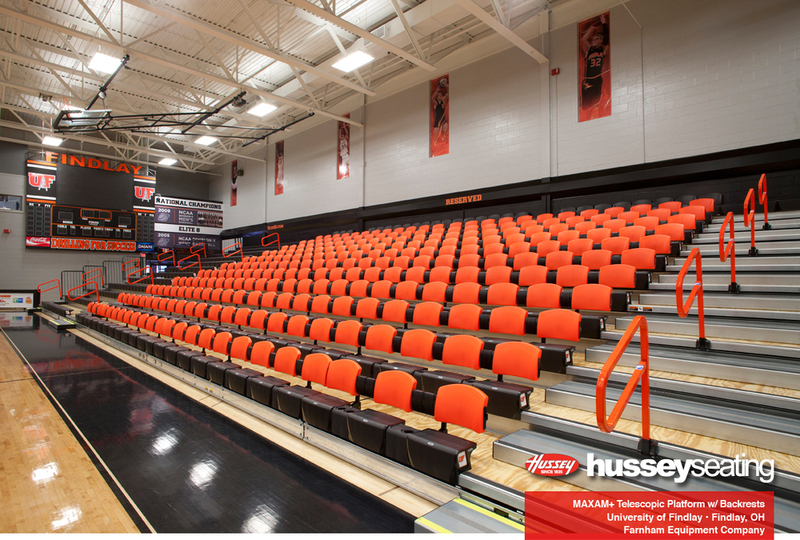 With aisles and handrails, end closure curtains for safety, and new individual seat modules for increased patron comfort, the gymnasium now offers an aesthetic that better reflects their championship-level programs. But beyond this, the team at Farnham Equipment Company also suggested several custom solutions. The first of which being the elevated front aisle on the team seating side to better separate spectators from the game floor. This feature also provides access and egress so fans can come and go as they please throughout the game. 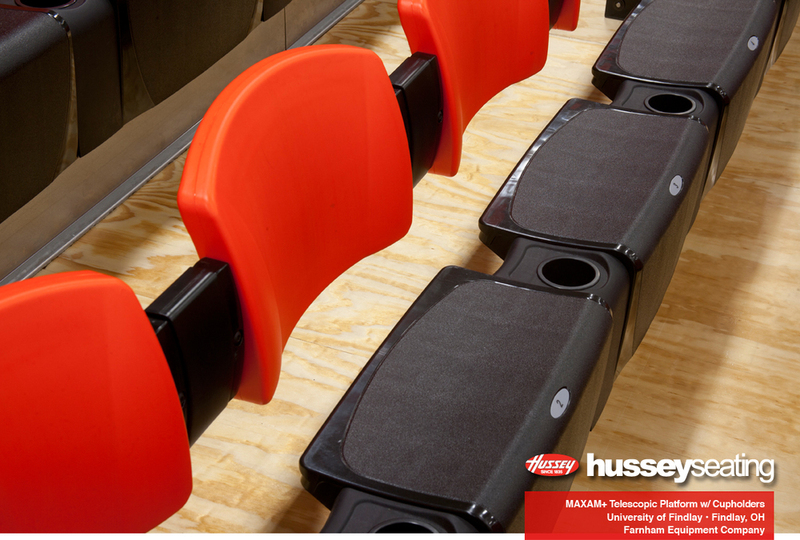 In addition to this, the university chose vibrant colored rails and custom graphics along with a new VIP section with comfortable contrasting colored backrests for paid booster seating. Finally, overflow was addressed with a MAXAM1 portable unit, an easily-configured module available on-demand to add capacity for their most sought-after locations. 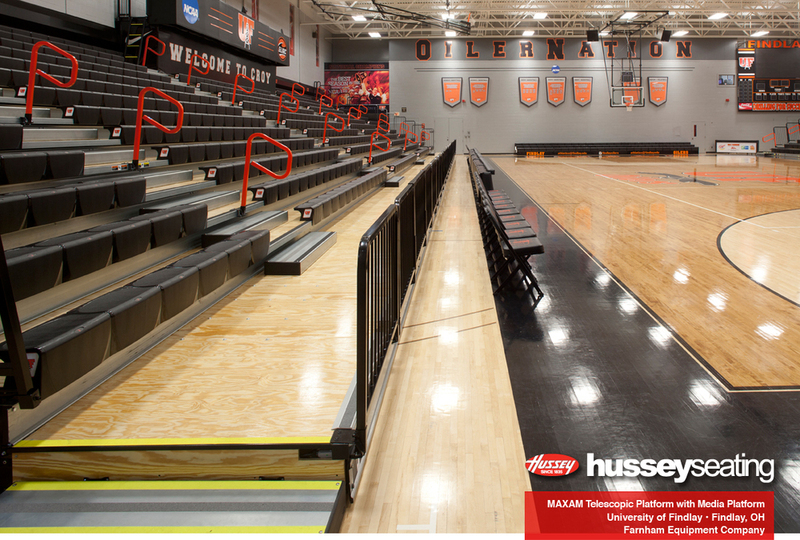 With an impressive gymnasium transformation, The University of Findlay achieved everything it set out to accomplish. It now boasts facilities that students, athletes, and fans absolutely love and that their opponents absolutely despise. What they described previously as essentially “a high school gym” has been transformed into a modern college arena. 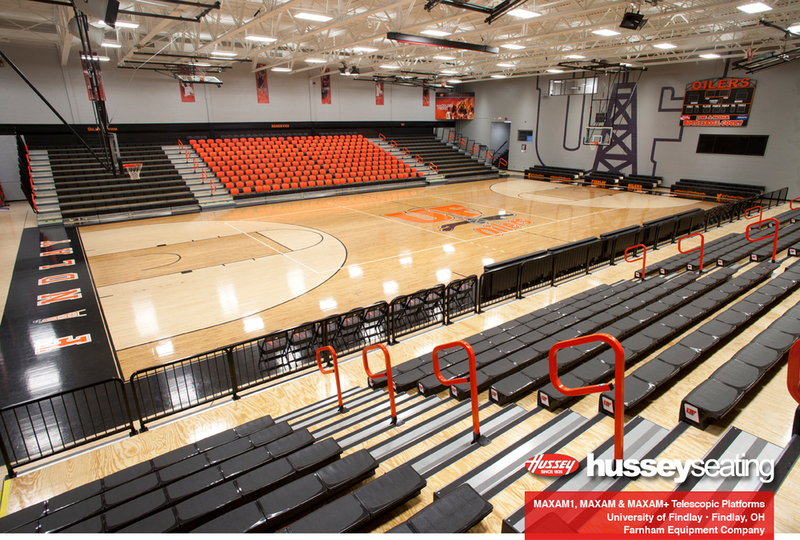 Croy Gymnasium is now a source of great pride and a strong recruitment tool to attract exceptional athletes to their program and students to their campus. In the end, this collaboration, Hussey’s openness to feedback, and its desire to delve beyond obvious challenges led to an exceptional gymnasium and a high level of trust that will be carried forward long after installation.